In fact, the only track that held racing last weekend was Stafford Motor Speedway, where their Friday night schedule worked well around the forecast. Speed51.com was there and has this report from the SK Modified feature. Please click here for the full story. The PASS Pro Stocks (Super Late Models) have waited over two years since their last race at Oxford Plains Speedway (ME), home of the richest Pro Stock open race in this part of the country, the Banknorth 250. After last weekend’s rain, competitors and fans will have to wait one more week. The event was moved back to this Saturday evening after it got washed out on April 30th. The Busch North season gets started on May 15th at Lee USA Speedway (NH) and Speed51.com will be there to find out if Santerre can win the season opener at the track for the fourth season in a row. Mike Johnson has had quite a bit of good fortune since our last regularly scheduled NASCAR Busch North Series event in the fall. He went out to California and won the NASCAR All Star Showdown in November, beating the best of the Busch North and NACAR West tours and now he has picked up a new sponsor for his family-owned #96 Ford team. Cabot, Inc., a maker of wood care products since 1877, will appear as the primary sponsor on Johnson’s car for the July 15th event at New Hampshire International Speedway. The season is young, but there is already a game of musical rides being played on the short tracks of Connecticut. Pitkat and the #81 team parted ways last week after a fourth-place finish in the season opening feature over Spring Sizzler weekend. Pitkat ended up with a new job as driver for a second Davidson Food SK Modified as a teammate to Jeff Malave while veteran driver Chuck Docherty will take over the #81. It won’t be the first time that Docherty and DiPisa have worked together. 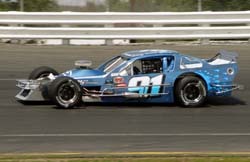 The car owner and driver were a combination in the Late Model division at the now defunct Riverside Park Speedway (MA) and won 10 races together there. Another driver in the SK Modifieds at Stafford is dipping his toe into the pool of the NASCAR Whelen Modified Tour. Frank Ruocco entered the Spring Sizzler at Stafford two weeks ago and turned many heads with a seventh-place qualifying run. Rain has been the story of the season so far in New England. The NASCAR Whelen Modified Tour, PASS Pro Stocks and True Value Modified Racing Season got their first events of the season in a few weeks ago. The NASCAR Mods even overcame a weekend of nasty weather to get their second scheduled event, the Spring Sizzler at Stafford Motor Speedway (CT), in the books. However, the second races for PASS and the TVMRS (at Oxford and Lee respectively) fell to the weather. No tour has been harder hit by rain than the ACT Late Models. Their scheduled season opener at Lee two weeks ago was a wash. This past weekend’s event at Thunder Road Speedbowl was also rained out. This pushed their 2005 opener back to this Friday night, May 6th, at Lee USA Speedway (NH). Regular weekly shows have also had no luck when it comes to rain. Last weekend, Beech Ridge Motor Speedway (ME), Waterford Speedbowl (CT), Seekonk Speedway (MA), Speedway 95 (ME), Unity Raceway (ME) and Monadnock Speedway (NH) were all among the tracks where raindrops fell, but green flags didn’t. The track did manage to fit one practice session in last weekend and the quickest driver in that was track regular Bill Whorff, Jr. Right behind him on the speed charts were Mike Rowe, Travis Benjamin, Corey Williams and Ben Rowe. There were 37 very diverse entries for the race, with a handful others possibly entering this weekend. The PASS and Oxford regulars were there, but so were a few other drivers including NASCAR Busch North pilots Ryan Moore and Bill Penfold, Canadian Lonnie Sommerville and the guy who will race anything with wheels, Ted Christopher. Kirk Thibeau towed to Oxford from Canada last weekend, but knocked a lobe off the cam in his engine and might not make it back for the rain date. Speed51.com reported it to you in late January, but now it is official. Three-time defending NASCAR Busch North Series champion Andy Santerre will be back to the series full-time in 2005 driving for Grizco Motorsports. He will wheel the #44 car for the team, which is now based out of Harrisburg, North Carolina for what is being already billed as his “Tour for Four”. Santerre has picked up a sponsor for five races during the season in Castle Chemicals. Their relationship actually goes back a few years already. Castle was an associate sponsor of Santerre’s for each of his championship seasons. Ruocco will enter some more Tour races this season, but don’t expect him to stray too far from his home track. Running with the Tour racers has been a good experience for Ruocco. Unity Raceway (ME) opens their season this weekend with all six divisions in action on Sunday featuring a 105-lap Pro-Stock race paying $3,500 to the winner. PASS drivers Johnny Clark and Scott Mulkern are expected to enter the event along with Maine Pro Stockers Tim Turner, Kris Huff, Matt Lee and Gary Norris. Also planning to run the race will be area racing legend Racin’ Ralph Nason. Depending on how they fare in Saturday night’s PASS event at Oxford, Scott Chubbuck and his #29 Jay Cushman-owned team might be there as well. The green flag at Unity is set to wave at 1pm on Sunday. Last season, many of the True Value Modified Racing Series teams entered Lee USA Speedway took part in the track’s annual Oktoberfest weekend of racing. It was not a points-paying event at the time. This year, it will be thanks to a rainout of last weekend’s schedule TVMRS race. With a full schedule of racing left for 2005, the rainout for Sunday’s wet TVMRS feature will be on October 23rd as part of Oktoberfest. The rainouts of the last few weeks have turned what looked to be a quiet Mother’s Day weekend into a full few days of coverage for Speed51.com. We will have coverage of the ACT opener from Lee, as well as the PASS race at Oxford for you this weekend. That is weather permitting, of course.